Brightech Ambience Pro LED Outdoor Garden Lights feature WeatherTite technology, which means we've built the wire with extra protection against nature. Wrapped in a strong rubber casing of premium quality construction, our strands will hold up to the harshest elements. They are well insulated so you can leave them out all year long, even during bitter cold winters. Rains will fall and winds will blow, yet these heavy-duty outdoor LED light sockets are strong enough to withstand the wear and tear of outdoor use every year. LUMINOUS DÉCOR FOR ANY OCCASION - Bathe your patio, garden, or pergola in a warm glow to set the mood for an evening of fun and laughter outdoors. The novelty of these heavy duty LED string lights will cast a spell over neighbors and friends at evening events like parties or reunions. Mesmerize your guests with the nostalgic aura of the exposed Edison style bulb filaments. Ambience Pro makes your backyard feel more like a splendid outdoor café! STRONGEST OUTDOOR LED LIGHTS ON THE MARKET - Built using durable Weather Tite technology, Ambience Pro lights your landscape while layers of insulation protect the strand from extreme hot/cold temperatures and rainy, windy, or damp climates. Rubbery and flexible, it's much thicker than a traditional cord, so you can confidently leave this LED light string on display through summers and winters. The UL certified Ambience Pro was designed to withstand the wear and tear of year-round outdoor use. 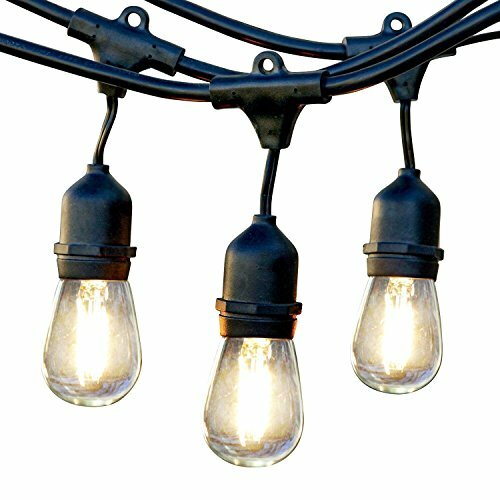 ENERGY EFFICIENT WEATHERPROOF LIGHTS - Connect up to 40 strands end to end, then customize arrangements from tree to tree or in a cluster thanks to the ample distance between the high efficiency Edison bulbs. Convenient loop on each socket allows for easy installation using eye hooks, zip ties, or 16-gauge guide wire (1/8 or 3mm diameter available at home improvement/hardware stores). To keep multiple strands together across a long distance, use electrical tape to secure the plug connections.